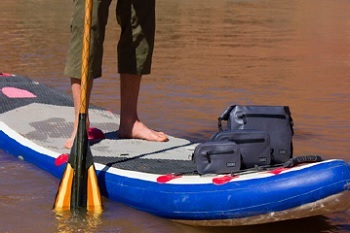 Salt Lake City, Utah July 7, 2014 – Chums, leading manufacturer of outdoor accessories, has announced the scheduled unveiling of its new line of outdoor accessory cases at next month’s Outdoor Retailer Summer Market in Salt Lake City. The functionally-designed cases, including the STORM, LATITUDE and PED lines, are purpose-built and store a wide array of accessories, outdoor gear, electronics and tools for organized outdoor travel and everyday use. The largest cases in the line, the STORM Series – Downriver, Voyager and Traveler – feature double TPU coated fabric with YKK water-resistant zippers and waterproof RF welded seams to ensure belongings stay protected and dry during wet excursions. The Downriver includes a water-resistant mail pocket with waterproof roll top closure and a removable one-handed quick adjust strap for easy carrying. The lightweight water-resistant Voyager and Traveler dual pocket accessory cases include hang on loops and accommodate a variety of small gadgets and tools for easy organization while on-the-go. The LATITUDE Series offers three different sized multi pocket accessory cases featuring a water-resistant plastic rear window mesh pocket for easy access to keys, wallet, lip balm and other travel pieces. Consisting of a heavy duty ballistic nylon with YKK water resistant zippers and hang on loops, the Latitude Series cases provide for convenient dopp kits for grooming tools or cooking utensils and come in a variety of colors including charcoal, meadow green, sunrise orange and horizon blue. For those traveling with sunglasses, tablets, cameras, phones and electronic gadgets, the PED Series features padded fleece lining and interior storage slots to ensure items remain protected and unscratched. The Tablet Case includes a water-resistant rear window pocket while the Gizmo and Tech cases feature a hang on carabiner, shoulder strap and oversized belt loop attachment for easy transport. The Holster also includes a hook and loop closure with bottom opening for tools or cables. All three accessory case series will be available to consumers online and at outdoor specialty retailers nationwide in early August. STORM Series: Downriver MSRP - $59.99, Voyager MSRP - $39.99, Traveler MSRP - $34.99. LATITUDE Series: Latitude5 MSRP - $15.99, Latitude7 - $17.99, Latitude9 MSRP -$19.99. PED Series: Tablet Case MSRP - $24.99, Gizmo Case MSRP - $24.99, Tech Case MSRP - $17.99, Holster MSRP - $11.99. For more information about Chums visit http://www.chums.com or contact Gordon Wright at Gordon@OutsidePR.com. In 1983, a Colorado River guide sought a simple way to keep his sunglasses out of the river. Through this innovative idea the Chums original cotton retainer was born. More than thirty years later, Chums is now a global brand that offers a wide range of outdoor products and apparel, as well as a leader in eyewear and PPE accessories in the industrial safety market for the past 20 years. Chums’ mantra is simple: provide fun, quality products to enjoy while at work or play. Chums: Helping you hang on since 1983.